In case you missed the live event last night, the Retro Sports Gamer channel hosted an incredible single elimination tournament of Basketball Classics at their regular location – DMen Tap. Some great matchups, but my favorite game of the night has to be Mort’s Utah 1989 against Tom with his 1991 Chicago. These guys are a blast to watch. Hope you enjoy as much as we did. We learned tons of stuff and are looking forward to talking about the game live on the Retro Sports Gamer channel this coming Sunday night. Visit the Retro Sports Gamer online at 10EST, November 4th. I’ve had a blast getting to know the Retro Sports Gamer crew. These dudes are carving out a much needed spot online with live streaming of retro sports tournaments. They are leading the pack when it comes to e-sports tournaments for the most beloved retro sports titles. They do weekly streams with responsive chat; tons of Tecmo Super Bowl, NHL ’94, heavy doses of NBA Jam, and much more. Well the RSG crew have been very supportive of Basketball Classics from early on. Shoutout to Lumberjack Cracks! Even though the game is somewhat of a departure for these NES/CRT purists, they are totally behind the spirit of it. The Tecmo Super Bowl style gameplay and classic basketball references are not lost on them. We wanted to show our gratitude and feature them on the game. This RSG team will be unlockable through the Story Mode+ that will be coming soon. However, you can see the team in action tonight (10/29) streaming live from Tom’s channel. Plus, they have invited us for a live interview next Sunday night (11/4). We’d love to have you participate in the chat! Now try to name the top 5 most impactful games. For that matter, try to keep it to just 10. I’m sure your own lists would differ. I can’t imagine that everyone would agree on all of these. However, it does seem universal that the games themselves are what people remember, more so than the people who made them. Without going into the reasons for why that might be, I want to share a few game developers in particular and their impact on video games. I really love seeing people put together “best of” lists for games. Especially if it involves whole communities of people. Then my absolute favorite is when you see a giant “bracket challenge” sort of list that claims a single winner. 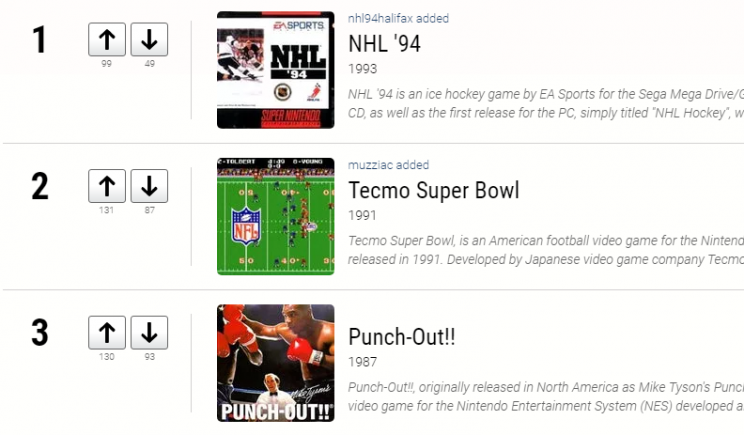 Regardless of the placement, one game that always seems to finds its way onto these lists is Tecmo Super Bowl- especially when it comes to sports titles. Well it is impossible to overstate how much of an impact Tecmo Super Bowl has had on Basketball Classics. In my mind, TSB stands in a class of its own. It’s not just about the NFL licensing either. Even as a sequel, the game was the first to accomplish so much. So who is responsible for such a masterpiece? What does this have to do with us? During development of Basketball Classics, Josh and I reached out to Akihiko Shimoji, the lead programmer of Tecmo Super Bowl. It almost seemed silly to think that we could somehow work with an absolute hero of ours (not to mention the fact that we were using automatic translators and googling whether or not it was customary to bow in a video message). To our amazement, we received a response. Seriously, the lead programmer of our favorite video game actually responded to us. And what’s more, he tried out the game and came back with several messages filled with wisdom. Even though he was clear about retiring from video games, he was kind enough to lend a hand and help out a tiny indie game like ours. His input has meant a lot to us and we have pored over it. I feel it has been crucial to the success of Basketball Classics. This concept is fascinating to us. It is at the core of what makes Tecmo a timeless classic. It simply feels the best. How this has actually impacted our approach to Basketball Classics shows up in countless aspects. From the music cues to the celebration overlays, to our new dunk system and even the play calling, we have tried to focus on rhythm- always trying to capture the sensation of pro basketball. A huge thank you to Mr. Shimoji for your thoughtful advice. Your example and humility is inspiring. We really hope to create a game that you would be proud of. Andrew Begley of the NLSC has been a fantastic supporter of Basketball Classics from the earliest of Early Access. Honestly, I can’t say enough about his contributions and openness towards a completely unknown, indie sports title. If you’re unfamiliar with the NLSC, it has been at the forefront of basketball video game media for over 20 years. Andrew himself has been invited to sneak previews of several NBA Live and other AAA titles. His positive approach has caught the ear of the giants of the industry. Many have even flown him around the globe for special events. Thanks so much for having us on Andrew! And for the rest of you, look forward to some NLSC related additions to Basketball Classics. We are so excited to share this great experience we had over the weekend! The video below is just the championship match from what was a super competitive, 8-player tournament. We loved seeing the different styles of play that were being used from player to player- not to mention all the different teams that were selected. Needless to say, the new dunk systems worked flawlessly. All players seemed to like the changes. We tried something new with this tournament by holding it at a local retro game store. Worlds Game Store in Salt Lake City has the most complete collection of retro games and consoles I’ve seen in the area. Coming from somebody who pieced together his own measly 100+ NES game collection over the span of several years, it is pretty impressive to see probably 500 NES games, even more SNES games, and a hearty load of Genesis games all on display. Sure the prices are absurd, but its still a super cool store. Like the Anthropology of retro video games. We can’t say enough for all the people who have graciously shared their feedback with us to help develop these new dunks. The retro sport gamers, NLSC, and the Steam community as a whole have been awesome. Also, as we have worked with Akihiko Shimoji (Tecmo Super Bowl), this was something that he most wanted to see developed further. 1) Dunk results shouldn’t be left to chance. 2) If you beat your defender to the hoop, they shouldn’t show up in front of you to contest the dunk. Hopefully you feel as we do, that each of these concerns have been addressed with the new dunk systems. Now in order to block a dunk, you simply have to be on the same level as the dunker- and this is reflected visually in real time. Also, if you do beat your man to the hoop, the chasedown dunk is initiated instead. This chasedown dunk is a more natural fit for the button mashing mechanic and better resembles what is actually happening on the court. Anyway, we would love to hear your honest feedback. Hit us up through Steam, email, or social media. Look, someone else let us on their podcast! These 2 Dudes (Nintendudes.com) have carved out their own spot in the Podcastosphere with over a hundred episodes of their NES podcast. Really sweet idea and fun coverage of different NES titles each show. We took part in their review of Double Dribble. Don’t be fooled by its title, Double Dribble is super fun. Huge inspiration for Basketball Classics. 1) Justin was totally right about the L.A. Breakers. I can’t believe I never knew that! 2) Are you someone who doesn’t like hearing their own voice? Well, you should try listening to it chipmunk-a-fied. Makes you feel super cool. 3) Honest thanks to the Dudes for having us on! Looking forward to the follow-up Patreon episode.. The Retro Sports Gamer has formed a real community on YouTube. If you are like me, this channel hits a spot that seems lost with the homogenization of current sports video games. Well suffice it to say, this Chicago crew knows their stuff. Think of any sports game you played as a kid and chances are, these guys have covered it. They just wrapped up a few live streams of their local tournament this week and actually included Basketball Classics in their lineup! We were thrilled to say the least. It was incredibly valuable for us to watch sports gaming experts turn on Basketball Classics for the first time and watch them pick up on the details of gameplay and player attributes. So you might not have a full 4 hours to commit to the video above, but definitely check out the 3 point buzzer beater from C-Houston around the 27 minute mark. Or when SG-Utah inexplicably speed boosts for the real championship at 1:35:30. Then after the tournament was officially over, they streamed another tournament that pretty much got dominated by 1989 Chicago. It would be great to get the game on consoles. Mort may have thought we stacked the Utah teams. We promise we didn’t! The speed bug gives players inhuman, Tecmo Bo Jackson level powers. Probably need to squash that one. Passes are getting picked off a tittly titch too many times. Button mashing on dunks is a controversial topic. Chicago must be the sports mecca of the world because they were dropping k-n-o-w-l-e-d-g-e. Anyway, a hearty thank you to Tom and the guys for putting this together. Hope you guys enjoy watching as much as we did. What is the Basketball game featured on Atari VCS Indiegogo? You may have already heard about Atari’s new console, the re-imagined Atari VCS. If not, definitely check out the Atari VCS Indiegogo Page. Everyone seems to agree that this new console has some beautifully designed hardware. Now the big question for Atari is… content. What will be on this new console? When we look at the page itself, we see Atari classics like Asteroids, Gravitar, and Centipede being played. Then a feature of Tempest 4000 (which looks incredible, being played with only the joystick!). But what is this mysterious basketball game I see? Is that Basketball Classics by Namo Gamo? The first 5 on 5 pro basketball game to feature decades of rosters filled with attribute rich players, on-the-fly play calling, and retro vibes galore? The one with a Story Mode and unlockable teams? I heard they worked with Akihiko Shimoji from Tecmo Super Bowl! It’s been years in the making. You can even get the game now through Early Access and become part of the development process. We were so excited to see this! Here is a re-imagining of THE mother of all retro gaming in the Atari VCS, and our game shows up. What an honor for us to be tied to this project. Howard Scott Warshaw, but they have definitely captured my imagination of what a new gaming console could be. They have been nothing but cool to us. This hardware looks incredible, the concept is intriguing, and they are listening to the fans. I will be getting the Collectors Edition All-in-one. By Spring 2019 when Atari VCS ships, we plan to have new and exclusive games for you to download or stream, including reimagined classic titles from Atari and other top developers that are ready-to-play, with even more to come! Author namogamoPosted on June 7, 2018 June 7, 2018 Leave a comment on What is the Basketball game featured on Atari VCS Indiegogo? Basketball is more fun with a shot clock. Just ask the fans at the Minneapolis Lakers and the Fort Wayne Zollner Pistons match in 1950 before it was instituted. The final score was 19-18. Sure it might cause some anxiety, but at least no one will be playing like George Mikan, see.